There are two basic elements of foam. The density and the firmness. The density is the weight of the foam and shows much material is in the foam. The higher the density, the heavier the foam. Density is measured by a number which when divided by ten is the weight of the foam in pounds per cubic foot. The firmness of foam is the amount of weight it takes for it to compress by 1/3. The foam that is lighter, which means has less density will not provide as much support as high-density foam. This is why high-density foam is more expensive. The high-density foam will last years longer than lower density foam. There are even examples of foam not needing replacement decades later. Seats with thick foam should have lower compression weight, while the opposite applies with thinner foam. Always wrap foam is some form of fiber batting for an easy increase in comfort. 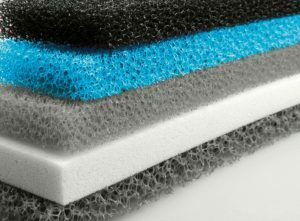 Firm low-density foam may go as little as a few weeks or months until we start to see or feel it losing its comfort and shape. The Foam Factory is a specialist company when it comes to providing foam replacement solutions for sofa seat cushions and various other projects.